When you live near a city it can be easy to forget just how many stars are in the night sky. But if you take the time to get away from the light pollution, spread out a blanket, and look up, there are more to see than you can imagine. It’s relatively easy to find a dark sky out west—what about in the southeast? Where can you escape the city lights and find a truly dark sky for stargazing? Here are six of the best places in the southeast to take in the majesty of the night sky. Before you head out, read this quick guide so you know what to expect and what to look for up there. Find your favorite constellations at Staunton River State Park. 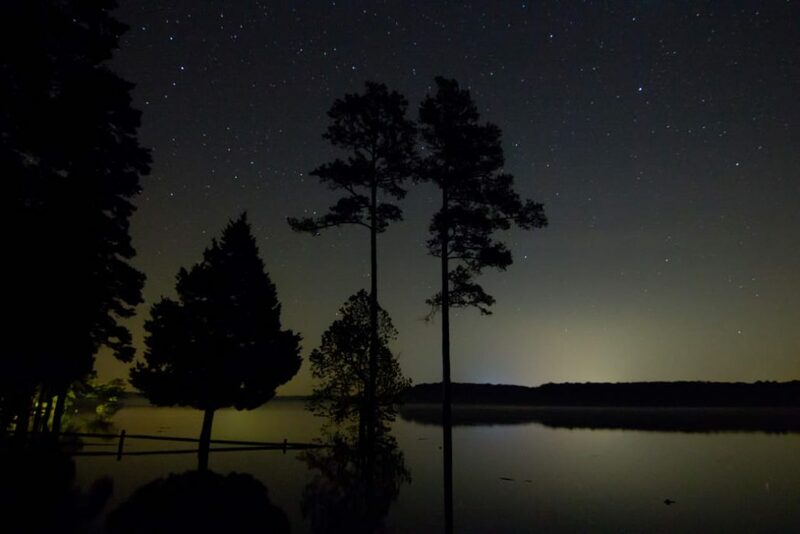 Designated a Dark Sky Park in 2015, Staunton River State Park is just 25 miles from the North Carolina border and sits between the Dan River and the John H. Kerr Reservoir. There are plenty of opportunities for fishing, swimming, and hiking, but the real draw is once the sun goes down. The park rangers host interpretive programs and there are telescopes available to rent—or you can just show up with your blanket. Bring a tent and spend the night at the park’s campground or rent one of the historic cabins built by the Civilian Conservation Corps in the 1930s. 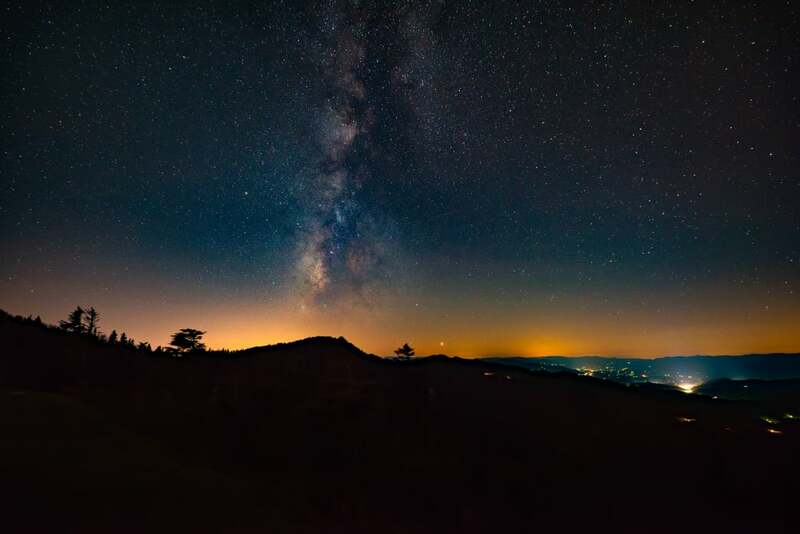 The Milky Way blazing from the Blue Ridge Parkway. If you’ve ever driven along the Blue Ridge Parkway, you know it’s some of the most beautiful scenery in the United States. But if you haven’t seen it at night, you’re missing out on the real magic! The Star Park is located in the Appalachian Mountains in Burnsville, North Carolina, and is managed by Maryland Community College. Surrounded by the Pisgah National Forest, it’s an experience that you won’t soon forget. Note: there is no camping allowed in this park. The Outer Banks in North Carolina is already a decent spot for stargazing, but if you’re serious about checking out the Big Dipper, head to Portsmouth Island. The 13-mile-long island is just south of Ocracoke Island, making it the southernmost in the chain of barrier islands. The only way to get there is by boat and there is plenty of fishing, shelling, and exploring to keep you busy during the day. Set up camp pretty much anywhere you want, and enjoy the peace and tranquility of one of the wildest islands in the Outer Banks. Facilities and amenities are very limited so make sure you are prepared before taking a trip out to Portsmouth. You might be familiar with the Obed Wild & Scenic River because of all the outdoor adventures to be had here, but what you may not know is that it’s also a newly-designated (2017) Dark Sky Park. 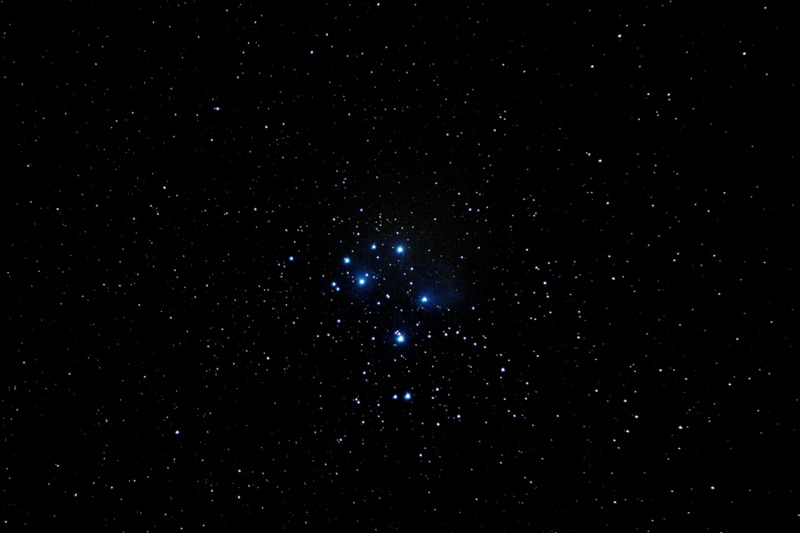 The National Park Service regularly hosts night sky outings and the Knoxville Observers and ORION Astronomy Clubs also host astronomy programs in the area. The park service offers a Junior Ranger Night Explorer program, making this spot particularly family-friendly. The park staff is also working to keep the sky around the Obed dark by prohibiting any permanent outdoor lighting. Star trails at Stephen C. Foster State Park. This 80-acre park might not cover a large space, but it does offer the unique opportunity to go stargazing in the Okefenokee Swamp, the country’s largest blackwater swamp. 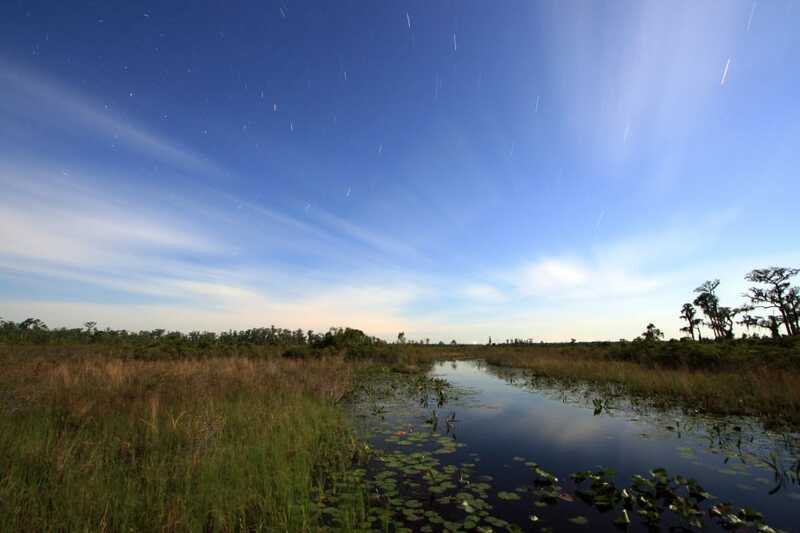 Stephen C. Foster State Park is part of the Okefenokee National Wildlife Refuge, so you can’t stay overnight, but the park is open until 10 p.m., which gives you plenty of time to get your stargazing fix. Sign up for the Swamper’s Guide to the Galaxy, a Constellation Cruise, or a Paddle Under the Stars to learn more about what you can see in the sky—and in the swamp! This state park lies within the Pickett State Forest in the Cumberland Mountains and is very close to the Big South Fork National River and Recreation Area. This means there’s a whole lot of nature and not a lot of light pollution. The area earned its Dark Sky Park designation in 2015, and the staff host several night sky programs in the summer. The park has regular campsites, group campsites, and cabins you can rent and stay for a whole weekend of stargazing.